Since 2008, the International Institute for Species Exploration in New York, USA publishes an annual Top 10 list of the new species discovered the past year. The annual list is released around May 23 to honor of the birthday of Carl Linnaeus, also known as the Father of Taxonomy. Amidst a rat, a worm, a stingray, two plants and other arthropods, the dragon ant Pheidole drogon that was described last year by researchers in our lab made the cut to the 2017 Top 10. 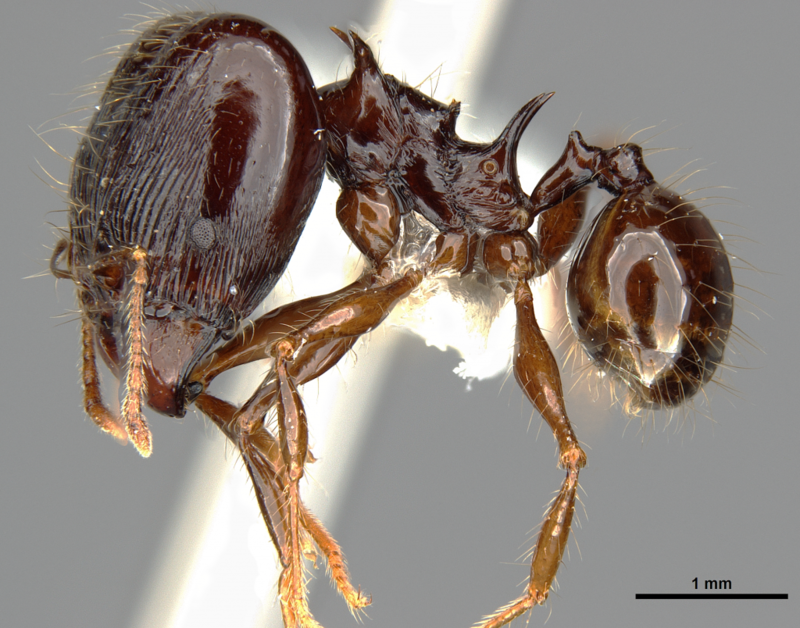 Along with Pheidole viserion, Pheidole drogon – found in Papua New Guinea – owes its name to the dragon in the famed Game of Thrones book and TV series. The idea was inspired from the large spines on the back of the ant, which is revealed to be a location for muscle attachment to allow great strength in the head and mandibles. The 2017 list of nominees also includes the bleeding ‘Bloodybone’ bush tomato, the spider Eriovixia gryffindori resembling the ‘Sorting Hat’ in the Harry Potter series, an amphibious centipede, a marine worm that look like a churro fried pastry, a South American plant which flower looks like a “Devil head”, a large spotted freshwater stingray, a millipede that continuously adds extra limbs throughout its lifetime, a vegetable-eating rat and finally a leaf-like katydid. The institute’s international committee of taxonomists selects the Top 10 from among the approximately 18,000 new species named the previous year. Written by the OIST Media Section, edited by Julia Janicki. 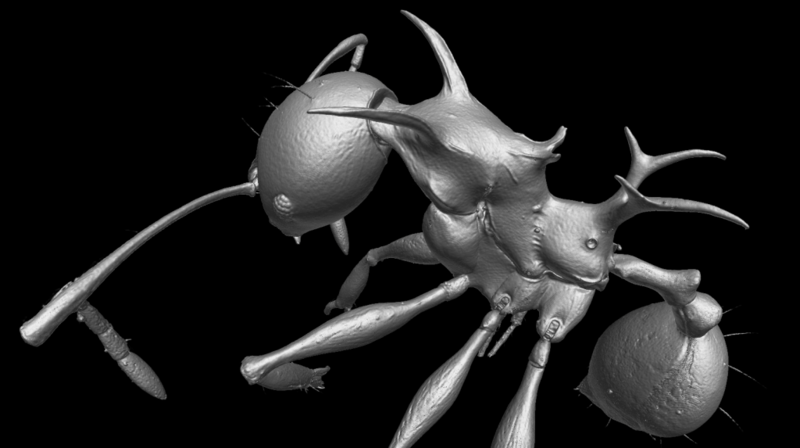 New ant species- in 3D! 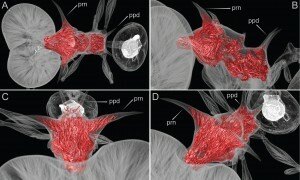 We have two new papers out in PLoS ONE today describing some new species and highlighting the potential of micro-CT for ant taxonomy. The first paper, headed by Eli and co-authored by Georg, revises one crazy spinescent Pheidole group from New Guinea, and notes interesting findings on the musculature under the spines. We named these species Pheidole drogon and Pheidole viserion after the dragons from George R.R. Martin’s A Song of Ice and Fire series. The second paper, led by Georg, revises the Pheidole knowlesi group from Fiji including complete micro-CT galleries of all castes of six species from the group. This knowlesi group is not as morphologically spectacular as cervicornis, but is of great interest to us as it pertains to our work on the taxon cycle hypothesis. We hope these show a glimpse of what cool things can be done with micro-CT for organismal biology, biodiversity studies, and taxonomy.